Operating hours: Not exactly sure, but it was already opened at 7.15am on a weekday until lunch time. I will find out the exact timing and hope to share with everyone soon. 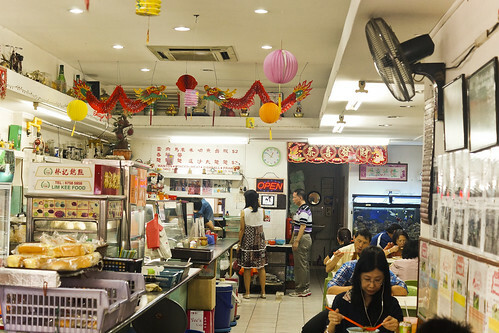 I chance upon this small cosy Cafeteria while walking to work from Good Morning Nanyang Cafe. It looks very old school, and the thing that particularly caught my eye was the stall signage – $2.00 for all of their noodles. Frenzlink sells items like Wanton Noodle, Minced Pork Noodle, Mee Rebus, Mee Siam, Laksa, Fishball Noodle, Lor Mee and Prawn Noodle. 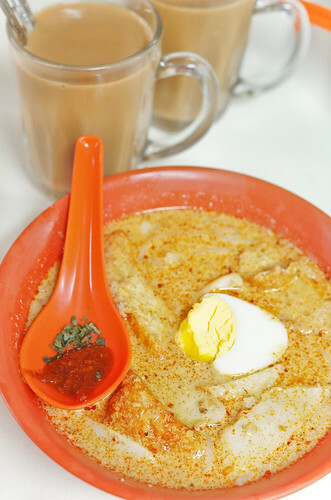 There is already a good crowd early in the morning and instead of a typical breakfast food – Fried Bee Hoon (they sell fried bee hoon also), almost everyone are having noodles, particularly their Wanton Noodle dry. So i made it a point to visit this place and try out their $2.00 noodle. I heard that Frenzlink had kept their price low at $2.00 for the past 18 years since. I miss the days where the stall helper will bring your food and drinks to your table instead of “self-service” and Frenzlink is still one of such places. This place is ran by apparent locals and were greeted with a “thank you” or “good bye” after my meal for all of my three visits. 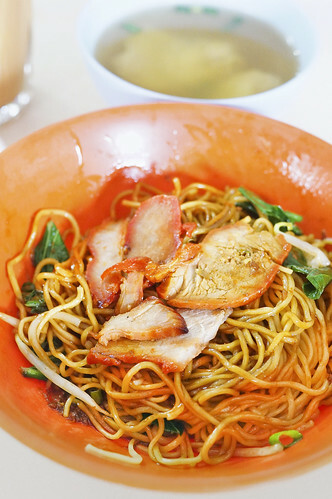 I had tried a couple of their noodles and Wanton Noodle is one of my favorites. 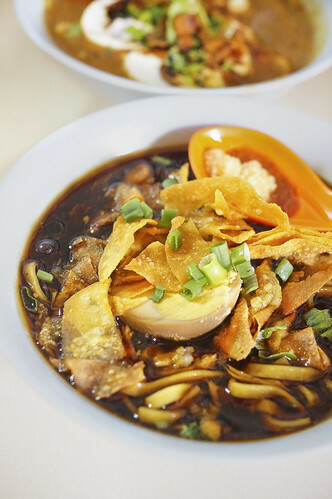 Their Wanton Noodle is the sweet black sauce style with lean Char Siew and not the gravy or oil style. Not mentioning about the soup that is a little bland and the mini wanton, i think their noodle is actually quite good for it’s taste and texture. The portion is not very big so i will order the $3.00 noodle if i am feeling a little hungry. 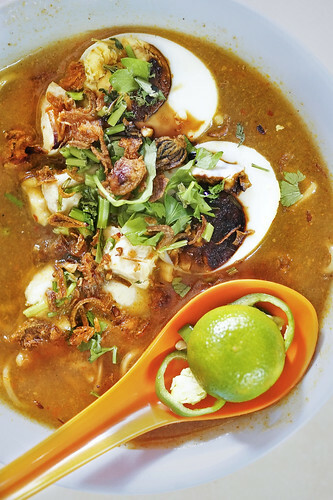 Their Mee Rebus is one of the best items in Frenzlink. The gravy is smooth and flavorful and not too sweet and comes with a whole hard-boiled egg. Imagine the egg cost $0.50 so i am actually paying $1.50. for the noodle The sauce don’t taste starchy and the smooth sauce coats the noodles without being too thick or watery. The Lor Mee is not bad. Gravy’s taste is acceptable, just that it’s slightly watery. It comes with two pieces of braised pork belly, half an egg, pieces of deep-fried wanton skin and two pieces of Ngor Hiang (five-spice roll). Quite OK for a $2.00 noodle. I prefer the other noodles compared to this Lor Mee. I think their Laska exceeded my expectation. I was not expecting a lot from a $2 Laksa but it is really decent. The gravy don’t taste “cheap”. It is rich, filled with coconut fragrance and the sweetness from the grinded dried prawn. There are 2-3 pieces of Tau Pok, half an egg and a few slices of fish cake. No cockles (hum) though. I didn’t have the photo of their minced pork noodle, but it’s not like our traditional minced pork noodle with lean meat, minced pork, pork ball and mushroom. Frenzlink version is rather unique with their own braised style of minced pork, and noodle. Not my favourite kind of minced pork noodle or at least not what i was expecting. Sorry, this minced pork noodle will be on my last-to-order list. Frenzlink is not the kind of place that i will travel all the way from Jurong or from Woodlands to have a meal here. This place is more of a hidden gem within the vicinity and is more of an interesting eat rather than an amazing eat. I am pleasantly surprised that such a place still exist in the CBD area and i thought i can still pop by in the future to support them whenever i can.